African clothes are bright and bold. If a person walks into a room wearing an African fabric or print, you won’t miss them. You can usually also tell that they’re wearing African dress – the style is not a shy one! In the West though, we’re a little more reserved; used to monochrome colours and heavy fabrics like wool or denim (and with the monochrome weather, who can blame us?). Empire Textiles offers African textiles from lace and brocade to head gear and handbags. These textiles are great to include in your everyday wardrobe and will bring a little colourful boldness to any outfit your wear. Use a West African Aso-oke to pull back your hair when it’s unruly, or wear a headtie as an accessory in itself. Try mixing a Georges fabric with jeans for a pop of colour in the office, or purchase a two piece wax print set to wear with a dark blazer. If you’re a fan of patterned fabrics, try a vibrant wax print in place of an animal print or flowery item. Winter doesn’t last forever – no matter how long it seems to go on! – so when the weather warms up, you could match African jewellery with a favourite summer dress or skirt. 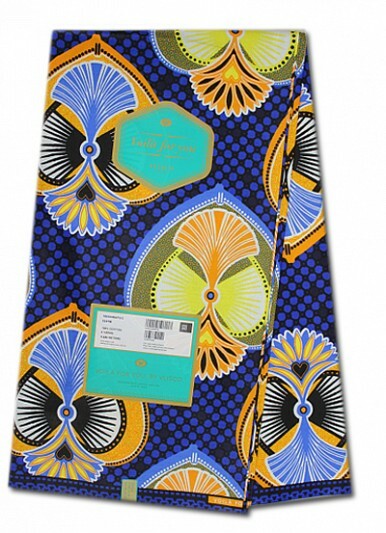 African colours are naturally associated with sunshine and heat, so if you’re heading off on holiday, take Vlisco super wax print to reflect the sunnier climate. If you’re going to a party and want to spice up a much-loved little black dress, or breathe some new life into a reliable handbag, add some Vlisco fabrics, such as a sash or scarf. If you’ve got an outfit for a special occasion but want to buy new accessories, try an Alberto Maldini wedge with a matching clutch bag. You won’t have to worry about anyone else at the wedding having bought the same outfit! Lace is a fabric associated with luxury, so if you really want to treat yourself, you could pick a French sequins lace or limited edition piece to really stand out from the crowd.